Sr. Simone Campbell has served as Executive Director of NETWORK since 2004. She is a religious leader, attorney, and poet with extensive experience in public policy and advocacy for systemic change. In Washington, she lobbies on issues of economic justice, immigration reform, and healthcare. Around the country, she is a noted speaker and educator on these public policy issues. During the 2010 congressional debate about healthcare reform, she wrote the famous “nuns’ letter” supporting the reform bill and got 59 leaders of Catholic Sisters to sign on. This action was cited by many as critically important in passing the Affordable Care Act. She was thanked by President Obama and invited to the ceremony celebrating its being signed into law. 1) Can you define Catholic Social Justice and how it plays into modern social advocacy? Catholic Social Teaching is based in the writings of the Popes since 1891 when Pope Leo XIII applied the Gospel to the reality of the industrial revolution. He articulated that since every human being is created by God, there is an inherent dignity of each individual and that together we strive to create a community that reflects God’s call to live in love. This love requires justice for all in society. Pope Leo said that humans were not to serve the economy, but rather all were to be served by the economy. Because of this, workers had a right to organized in labor unions to bargain for their just wages and working conditions. Each Pope since Pope Leo has written at least once about this application of faith to our lived political reality. Candidly, many of the documents are very difficult to read because they were originally written in Latin and then translated into the languages of the world. Pope Francis currently is writing the most accessible documents on the role of Catholic Social Teaching. In Laudato Si (his encyclical on the environment) he states that the same minds that exploit people exploits the earth. He challenges the global community to come together to care “for our common home.” What could be more applicable to the struggles of today’s world? 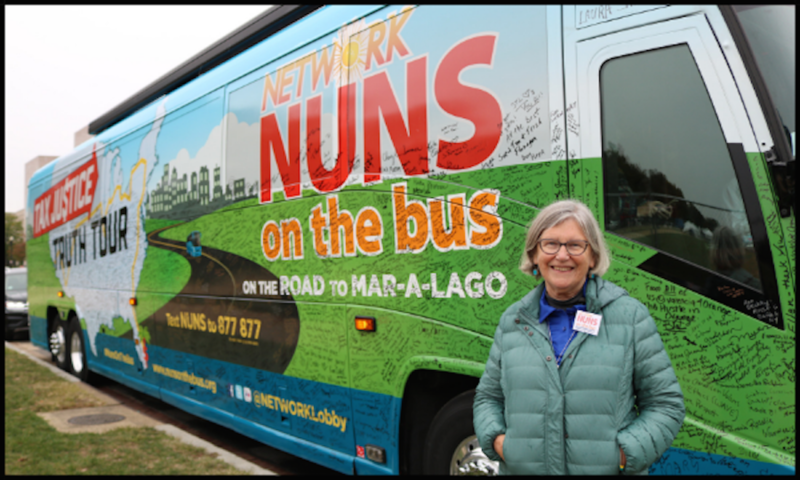 2) You wrote “A Nun on the Bus: How All of Us Can Create Hope, Change, and Community” which chronicled your tour throughout the U.S. in 2012 to rally support against Congressman Paul Ryan’s budget. What issues do you feel need the most attention and support in this current administration? There are many issues that require our attention at the federal level. The ones that we work on at NETWORK are to mend the income and wealth disparity in our nation. Because of this, we work on tax policy, wages, and just working conditions, as well as access to democracy, healthcare, immigration reform, and housing. We believe that these are the crisis issues in our nation that are fueling the political divide. We find that there is an individualism that is fertile ground for fear and thus anger. Too many people in our nation, especially white people, have accepted the fallacy that we are on our own and need to do things ourselves. This creates division and competitiveness. The truth is that we are meant to be communal and to ensure that our communities thrive. We will only do this if we move toward a shared goal of the common good. This requires healing the huge divide in income and wealth. It doesn’t mean that everyone has the same amount, rather it means that everyone can live in dignity. 3) What are your thoughts on what’s going on regarding sexual abuse by clergy members? Our beloved Church is finally having to face the sinful reality of the abuse of children by priests who were supposed to set the example for the community. It is about time that the leadership pays attention. They have had enough warnings about the crisis. I think the people are finally fed up with broken promises that the situation would change. I think one of the biggest mistakes made by the Church in the initial attempts to deal with the crisis was that the hierarchy turned the whole situation over to civil lawyers. The focus of the lawyers was “mitigating damages.” There was no (or little) pastoral concern. There was no pastoral response. Where was the repentance and spiritual engagement? Several commentators have said that if priests could marry then this would not have happened. I want to make clear that pedophilia is not a problem of sexual “frustration.” Child sexual abuse happens in some families. It is sexually aberrant behavior that is not “normal” nor changed by adult sexual activity. Having a married clergy is an entirely different question that I believe should be addressed. 4) What are your thoughts on this administration’s ideology and policies on immigration? It is difficult to find words to articulate for polite society what I think about this administration’s policies and attitudes toward immigrants. It is shocking that a President who is married to an immigrant and whose family’s immigrant story is well known has such little regard for those who are leaving home out of desperation in an effort to find a better life for their families. His scapegoating of immigrants is a tried and true way of spreading hate. It creates a “them” so that the “we” doesn’t ask questions about their own reality. Much of U.S. policy toward Mexico and Central America has created the turmoil that people must leave in order to survive. We as a nation have a lot to atone for. 5) What personally inspires you to move humanity forward? What keeps me going is a spiritual practice of meditation and my grounding in community. On the days when I’m feeling week, someone else has more energy that supports me. Additionally, my heart is broken open by so many people I meet who share their stories of struggle and hope. With a heart broken open, I can’t stay on the sidelines or walk away. This is the call of community to walk together supporting each other. For me it is what Jesus did and what we are called to do. 6) How do you see us mending the divide that currently exists in this country? We at NETWORK are trying to “mend the gaps” in our country through policy change. But we are also engaged in trying to understand how other people see the situation. This year we are doing a series of Rural Roundtables to understand the perspective of people in rural parts of our nation. Unless we understand each other, we cannot begin to come together. So far we have held four of these events in different parts of the country. These have been rich conversations, and I’ve come away with a greater appreciation of challenges faced by our rural neighbors. So I suppose that my recipe for healing is listening and asking questions. Let us not be afraid, and rather come to understand our neighbors. This piece was featured in the April 7th edition of The Sunday Paper, Maria Shriver’s free weekly newsletter for people with passion and purpose. To get inspiring and informative content like this piece delivered straight to your inbox each Sunday morning, click here to subscribe.